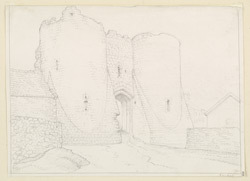 View of a gatehouse flanked by two cylindrical towers, apparently at Denbigh Castle in Wales. Denbigh Castle was not a royal castle. It was built by Henry de Lacy, Earl of Lincoln and one of Edward I's wealthiest and militarily successful barons. It was built in two stages during the period 1282-1311.